The amount of CO2 in the environment can be controlled by the reduction of CO2 with H2 to form products such as formic acid, methanol, and methane. The hydrogenation of CO2 to methanol has been completed with the use of single metal ruthenium catalysts. 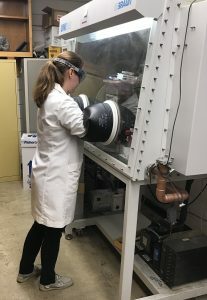 My project, under the advisement of Professor Chin at the University of Northern Iowa, will study whether the bimetallic nature of diruthenium catalysts can produce a higher turnover of CO2. Unpublished results from the Chin group have shown some diruthenium catalysts to be effective catalysts of hydrogenation type reactions. The two catalysts used in the study include two ruthenium metals connected by a doubly linked cyclopentadienyl ligand. One complex contains a dipyridyl ligand on each metal and two bridging hydride ligands. The second complex includes a naphthalene bound to one Ru and three acetonitrile ligands bound to the other Ru. These complexes were selected for their advantageous ability to improve catalyst performance via ligand exchange. The efficacy of the catalysts and the identity and quantification of the reduction products will be analyzed by 1H NMR spectroscopy and GCMS analysis.